1:13 a.m. — Police received a call about a man stumbling around in the middle of the road between Payne Avenue and North Columbus Street. A relative picked the man up and took him home. 1:17 a.m. — A man called police from the 300 block of Third Avenue and reported his girlfriend was throwing his stuff out the window. When police arrived, the girl had reportedly cut her finger. She refused treatment and no other action was taken by police. 2:34 a.m. — A man called police from the 300 block of West Church Street and said his car had just been broken into and had taken off running. 3:02 a.m. — An employee of the Rainbow Motel, called police and said a man had just walked into the motel office and said he had been beat up. No other information was available. 9:35 a.m. — Police responded to a domestic dispute in the 600 block of Fairview Avenue. One of the parties left for the night. 3:59 p.m. — A caller reported a vehicle with an infant alone inside in the 100 block of Harding Way East. Police found the car, but there was only a bag of trash inside. 4:41 p.m. — A caller in the 800 block of Briarwood Drive told police a relative was being harassed on social media. 4:52 p.m. — A caller from a medial office in the 200 block of Portland Way North reported an employee had been threatened. 8:01 p.m. — A man reported he and another relative had been threatened. 9:45 p.m. — A resident in the 200 block of Eighth Avenue reported a relative was getting messages on social media, from someone “threatening to shoot up” our house. 2:08 a.m. — A person came into the police station to report two sexual assaults that had happened in the previous four years. 4:31 p.m. — A resident in the 300 block of North Columbus reported 36 CDs stolen from is vehicle overnight. 6:38 p.m. — A resident in the 100 block of Harding Way East reported vandalism the home. The caller said someone entered the home, threw trash all over the house took dinner and threw it on the table. 7:28 p.m. — A resident near Nazor Road and Ohio 309 reported finding a license place and the front end of a car in the road. 7:47 p.m. — Police responded to a dispute between family members in the 200 block of East Church Street. 10:02 p.m. — A resident in the 400 block of Sherman Street reported someone had swiped their care between 5 p.m. and the time of the call. 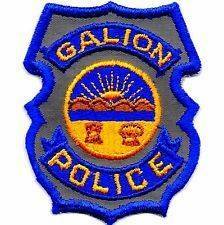 12:42 a.m. — Police talked to a man and advised him of Galion’s noise ordinance after someone reported four-wheelers on private property. 1:22 a.m. — A resident in the 500 block of Galion Arms Court reported a drunk relative with a knife. The relative said he would stay away for the night. 2:02 a.m. — Police and medics received a call about a 22-year-old woman who was drunk and having trouble breathing. The call came from the 500 block of Galion Arms Court. The girl was taken to the hospital. 9:53 a.m. — A call from the 300 block of Cherry Street reported a car window busted and a wallet and GPS stolen. 12:32 p.m. — A loud dispute between people was reported in the area of New Winchester Road and Rensch Avenue. 6:54 p.m. — A man in the 400 block of Libby Lane reported being harassed by a woman. The caller was given instructions on how to get a protection order. 7:31 p.m. — Police received a call from Circle K on East Street about two boys “who stole a bunch of stuff” and took off running. 9:53 a.m. — Police received a call about a possible breaking and entering in the 800 block of Harding Way East. 4:04 a.m. — A 14-year-old girl reportedly went missing Sunday evening. Police searched for her during the day and she was spotted several hours later near the intersection of Fairview Avenue and Sherman Street and later picked up at a residence on Pierce Street. 7:43 a.m. — A caller told police a boy on a bike fell and hit his head in the area of Rite Aid on Harding Way West. He was taken to the hospital. No other information was available. 10:32 a.m. — Police responded to domestic dispute in the 100 block of South Boston Street. The dispute was over by the time officers left. 12:31 p.m. — A caller reported a “grow room” in an apartment at the Cedargate complex on Portland Way North. 4:22 p.m. — Police received a call of possible drug activity at a house on Grove Avenue. 5:22 p.m. — A bike was reported stolen from a residence in the 100 block of South Riblet Street. 5:46 p.m. — A caller in the 100 block of Harding Way East reported being harassed for the past three or four months by the same two girls. 5:52 p.m. — Officers responded to a domestic situation in the 1400 block of Baehr Street. One of the people involved in a verbal altercation volunteered to leave for the night. 6:22 p.m. — Police investigated a domestic dispute in the 100 block of Harding Way East that included death threats. The caller said she didn’t want to pursue charges, but wanted the person who made the threats to receive help. 7:08 p.m. — Police received a call that someone hit a parked car in the 800 block of South Market Street and then took off. 7:50 p.m. — A caller reported seeing two kids on the roof of Galion Primary School. Superintendent Jim Grubbs told officers he wanted to press charges against the kids. 8:17 p.m. — Officers responded to a domestic disturbance in the 600 block of North Market Street. 9 p.m. — A reported argument between two people at East Park resulted in “verbal” warnings about disorderly conduct. 9:51 p.m. — A Harding Way East resident was taken to the hospital after a relative told police he was having suicidal thoughts.